Visiting the Rime Center for the very first time can be an overwhelming experience. Let us put you at ease. The Rime Center strives to make your first visit to us as friendly and enjoyable as possible. We want you to experience the vibrant ambiance of our center. 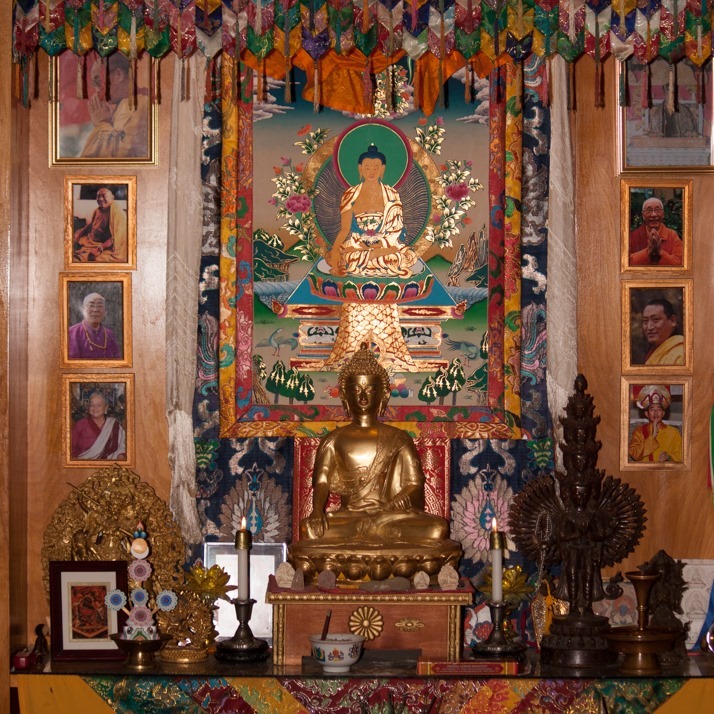 Whether it is the colorful paintings hanging on the walls, the smell of incense drifting through the air, the sacred surroundings of our shrine room, or the friendly people you will meet, we hope you and your family will find the Rime Center a place to call home. The Rime Center is located near the crossroads arts district and is in the heart of Kansas City. Like most locations in that area the Rime Center only has on street parking next to the building. There are two nearby parking lots. The first is a block just south of the center, underneath the I-35 bridge near the corner of Jefferson St and Cesar E Chavez Ave. The second is underneath the I-35 bridge just north of the intersection of W Pennway St and W Pennsylvania Ave.
We do ask that you are considerate of our neighbors and not park in front of any residential homes along Jefferson St or in the KCFD fire station’s parking lot. Upon arrival at our center you may notice the steep stairs leading into the building. We have a second entrance towards the Southwest Corner of the building that has both fewer stairs and also a stair lift for those who need assistance. The second entrance is through the Chiro Studio gate. As you enter the main building, you will receive a warm welcome by our greeter. They will be able to answer your questions as well as direct you to our shrine room. Feel free to look around and make yourself at home. We also encourage you to take photos, but ask that you not use a flash during our Sunday service or meditation periods. Restrooms are located through the door in the Northwest corner of the shrine room. You can get there by entering the shrine room and going straight across the back wall. Once through the door take the hall to your immediate left. There is a small staircase down to the restrooms so if you need help just find one of our friendly volunteers to assist you. You can’t miss them, they are wearing maroon Rime t-shirts. The Rime Center understands that parents who want to attend our Sunday Service want to have options for children. During our Sunday Service our Rime Dharma School meets upstairs. 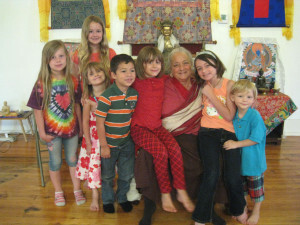 The Dharma school is for kids ages 4-12 and is dedicated to the cultivation of wisdom and compassion. The Dharma school is a refuge for the nurturing of inner peace, kindness, and community understanding. The Dharma school’s primary objective is to provide a qualified program of Buddhist studies for children. The Rime Center also has a nursery available during the Sunday Service for parents with infants and children under 4. These guidelines are simply a matter of courtesy. Courtesy that springs from the heart, a result of respect, has, since ancient times, formed a part of spiritual disciplines. 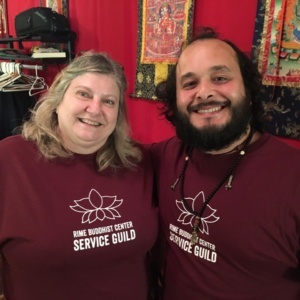 To be courteous, respectful, and polite is not superficial, but can be a great practice of mindfulness and a way to develop bodhisattva actions. 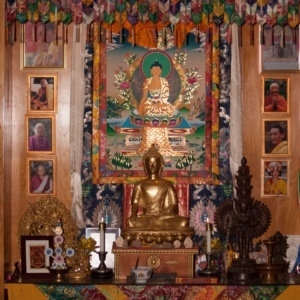 It is with this attitude that one may approach the particular kind of attention to detail that showing respect involves, be it to a lama, in a shrine room, or in ordinary daily interactions. Shoes should be removed and left at the door. Hats should never be worn in the shrine room. Short skirts or revealing garments are not appropriate attire. If a street length skirt is necessary for some reason, it is wise to bring a shawl to drape over the legs while sitting. Do not sit with legs outstretched in front of you if you are facing the shrine or the teacher. This is considered a sign of disrespect, and of course, lying down shows great discourtesy. If you must stretch your legs out in front of you, be sure they are pointing away from the teacher or shrine. Dharma books and puja texts should never be placed directly on the floor, out of respect for the truth that they contain, but should be placed on a table or cushion. Texts should never be stepped over, stepped on or sat on. When entering the shrine room, a Buddhist practitioner may do three prostrations facing the shrine, or make a short bow with hands folded.